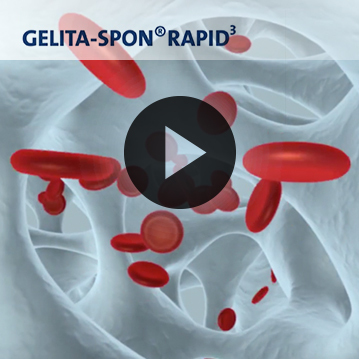 GELITA MEDICAL is specialized in the manufacture of innovative absorbable hemostats. Medical progress and new surgical techniques require modern medical devices. GELITA MEDICAL provides suitable products by identifying continuously customer needs and creating novel tools to ensure a fast and efficient hemostasis. In short, we provide optimal solutions for surgical experts. 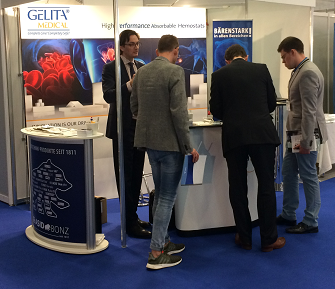 GELITA MEDICAL participated together with its German distribution partner at the 135h Congress of the German Society of Surgeons (DGCH) from 17th to 20th April 2018 at the exhibition center in Berlin. The annual convention of the DGCH takes place every year alternately in Munich or Berlin and is considered as the most important surgical event in Germany. The congress addresses current topics to doctors from the clinic and practice of all surgical areas as well as employees in the nursing and surgery service. During the 4 days event GELITA MEDICAL had the opportunity to welcome surgeons, nurses and OR staff members from all regions of Germany and from different surgical specialties. Some international visitors attended the DGCH and showed big interest in GELITA MEDICALs innovative hemostats. Just as during previous events, especially GELITA TUFT-IT®, its handling benefits and performance in different procedures attracted the attention of surgeons. Big interest was shown in performing tests with TUFT-IT® in surgical trials.